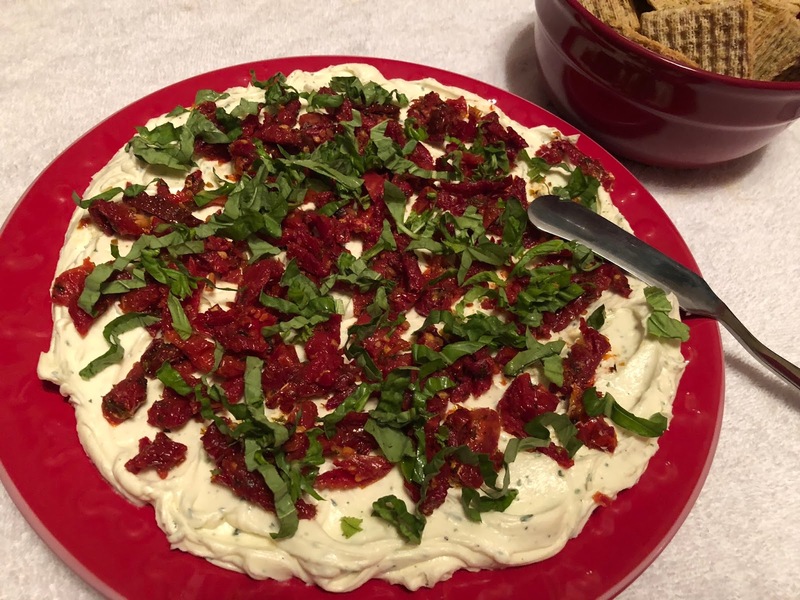 Here's a really simple party dip that you can throw together in a snap. I made it for Tory and Ryan's house warming party and everyone gave it a big thumbs up! Basically, I wanted to make a quick dip, but didn't feel like going to the store. This is what I happened to have on hand, so here we are! Its brilliance is in its simplicity, really. It's pretty much one of those "how can this not be good" sort of dishes. And it only uses a few ingredients, so it's as easy as can be to throw together. Sometimes the simplest things are the best, dontcha think? Make this for your next party or casual hang. Using an electric mixer, simply whip together the cream cheese and ranch dressing. Spread onto your serving plate in an even layer. Top with sun dried tomatoes and ribbons of fresh basil. Serve with Triscuits or your favorite cracker. Not a fan of ranch dressing? Use any other kind of creamy salad dressing you like! But seriously, who doesn't love ranch dressing??? That would be like not loving bacon. That just makes no sense to me. For years and years, I've wished for a pumpkin cookie that was more chewy than cakey. I mean, don't get me wrong, I do love the favorite pumpkin cookies, but they're very soft and cakey and frankly not very cookie-like. Then I happened upon a blog called Life Made Simple, and apparently she and I had the same wish! Thankfully, she figured out how to make a cookie and not a cakey! Who knew that using melted butter and corn starch along with limiting the eggs to just one yolk would do the trick? BRILLIANT! So, thank you, Natalie from LMS, for solving this mystery. 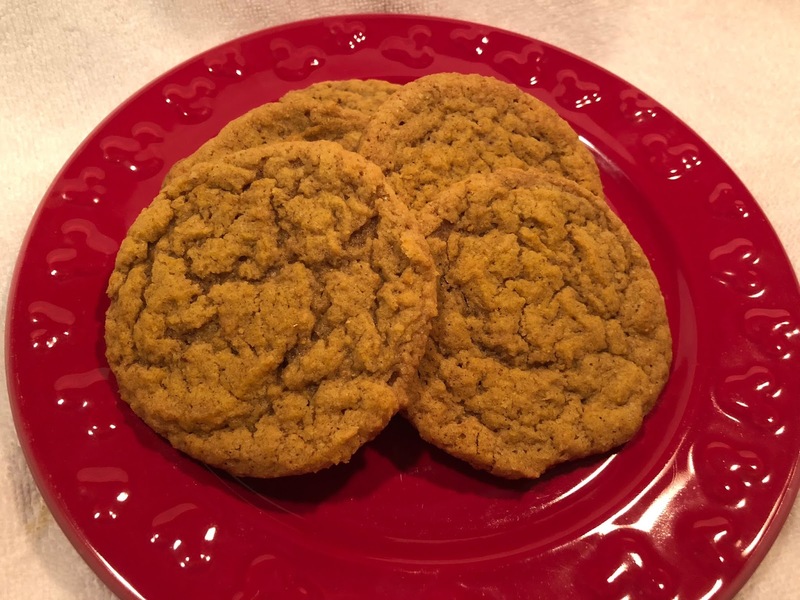 This will now be my go-to pumpkin cookie recipe! In a large mixing bowl of the bowl of a stand mixer, beat the melted butter and sugars for 2 minutes on high. Add the vanilla extract, pumpkin puree, and egg yolk, mix on low until just combined. In a medium size mixing bowl, whisk together flour, cornstarch, salt, baking soda, cinnamon, and pumpkin pie spice. With mixing speed on low, gradually combine with the wet ingredients, mixing until a soft dough forms. Cover the bowl with plastic wrap and refrigerate for 1 hour. Preheat oven to 350 degrees. Line a baking sheet with parchment paper or a baking mat. Scoop balls of dough using a standard size cookie scoop and place on the prepared baking sheet. Place in the oven and bake for 10-12 minutes or until golden brown on the edges. The cookies will be slightly puffy but they will flatten as the cool. The longer you bake them the more crispy they will become. Remove from the oven and allow to cool for 5 minutes on the sheets before transferring to a wire rack to cool completely, about 5 additional minutes. The original recipe included chocolate chips, but I prefer to leave them out. It always seems to me chocolate takes over when it's paired with another flavor, and I wanted pumpkin to be the star here. To be fair, I tried the recipe with mini chocolate chips and with pecans. I still prefer just plain pumpkin! She also uses bread flour in the original recipe but stated that AP flour was also fine. Since I didn't have any bread flour on hand, I went with it and they turned out great! There are many sugar cookie recipes out there, all of which claim to be the very BEST. Well, I guess one would have to taste ALL of them in order to come to that conclusion, so I'll just say these cookies are pretty darn good! Fair enough? 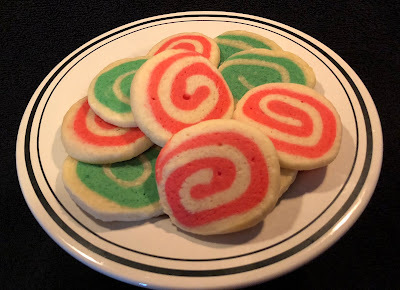 I was browsing on FB and saw a video of how to make pinwheel cookies. I figured, ok, that looks festive, let's give it a go! The thing is, you can really use any rolled sugar cookie dough, so I set out to find the right one for me. 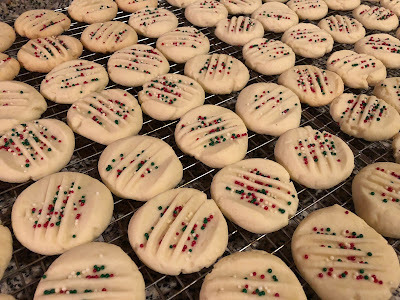 I decided I wanted one with almond extract in it (because that's a classic flavor when it comes to sugar cookies), and I found this one on a blog called The Slow Roasted Italian. They seemed very classic and homey and basic, so I went with it! They tasted exactly the way I hoped they would! Soft and chewy with rich vanilla and almond flavor, and they're pretty enough to jazz up any tray of cookies. They do take a little extra time, but you can do them a step at a time so it's really not that bad. When I made them, I mixed up the dough one day, rolled them into logs the next morning, and then sliced and baked them the following night. See? Easy! 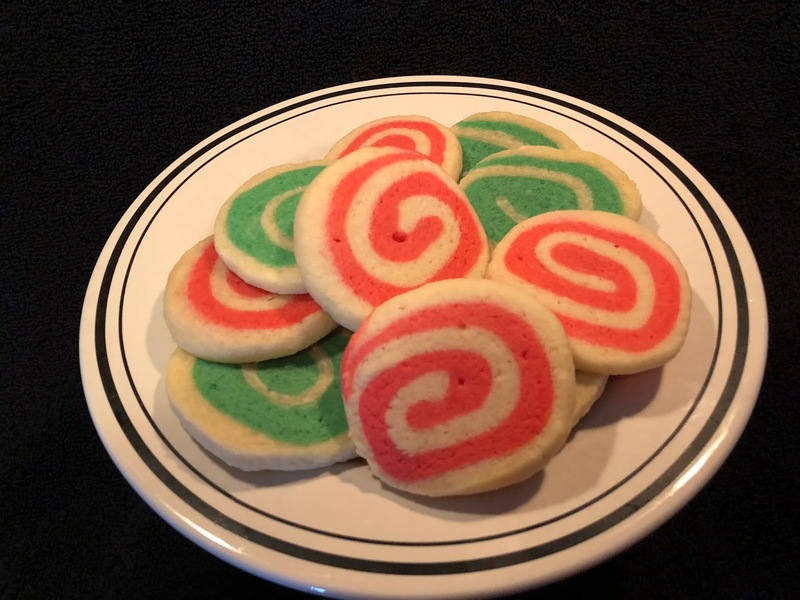 You can even roll the entire log of dough in colorful sprinkles or red or green sugar to add an extra little pop of color around the edges of your cookies. Also they don't spread out to much so you can literally bake an entire batch in one go. Definitely place a tray of these little gems in the center of your dessert table, and you'll surely get lots of OOs and AAHHs! In the bowl of your electric mixer (or with a hand mixer), cream the butter and sugar, on medium speed until light and fluffy (about 3 minutes). Add the eggs, vanilla, and almond. Beat until combined. Add the salt and 3 cups of flour; beat until you have a smooth dough. If the dough is sticky (meaning when you touch it and pull your fingers away the dough sticks to you), add more flour a tablespoon at a time until it comes together. Separate prepared dough into 2 halves. Add 1/2 of your cookie dough to a stand mixer and add red or green food coloring until your mixture reaches your desired color. You can also knead food coloring into dough until completely combined if you do not have a stand mixer. Wrap each half in plastic wrap. Refrigerate for about one hour or until firm enough to roll. Place red cookie dough on parchment paper. Roll out to about 1/4 inch thick rectangle. Set aside. Place plain cookie dough on a sheet of parchment paper. Roll out to about 1/4 inch thick rectangle. Stack cookie dough sheets on top of each other with the parchment on the outside. Remove the top parchment and roll over the dough gently with a rolling pin (to help the 2 doughs become one). Beginning on one of the long sides, roll the cookie dough into a log (removing the remaining paper as you go). If dough is too soft to work with, refrigerate for 30 minutes and then try again. Once dough is formed into a log, wrap tightly with plastic wrap and refrigerate 3 hours to overnight. Slice cookies and place on cookie sheet about 1 inch apart. Bake 9-11 minutes or until the cookies feel set. Allow to cool for 5 minutes on the cookie sheet and then transfer to a cooling rack to cool completely. It's your choice whether to make white cookies with a colored swirl, or colored cookies with a white swirl. Before you roll up the log, your dominant color should be on the bottom, and your swirl color should be on top. Savvy? If you're not a fan of almond extract, use any kind of flavoring you like! I've used orange extract and also rum extract, you could use lemon extract, or just use twice as much vanilla. It will all work! Be sure to give it time to chill in between steps. It makes it MUCH easier to slice when the log is completely chilled and firm. Also be sure to keep the log as round as possible, otherwise your pinwheel design will have flat edges. 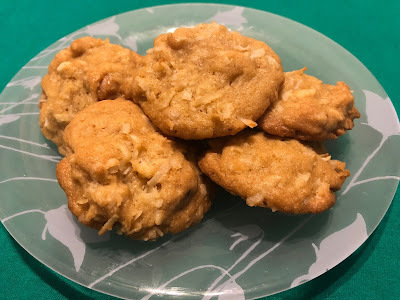 Aaaaanyway, as I was reading through my brand new Mrs Fields cookie book, I happened upon this recipe for cocomia cookies, which is short for coconut macadamia nut cookies. I thought, "ok, THIS will be the first recipe I try!" and they've been my absolute favorite Mrs. Fields recipe ever since. Actually, if I'm being honest, there wasn't a single recipe in that book that I didn't love, but the cocomias were still my favorite! 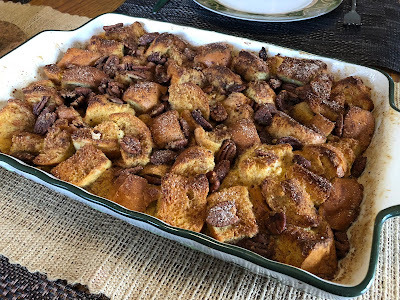 (Side note, this is also one of those recipes that I've used for years and years, and THOUGHT I had already posted it, but then when I recently went looking for it, I discovered that somehow it slipped by me! Ah well, better late than never!) Oh, and one other thing... Yes, yes, I know it's a bit of an investment to buy the macadamia nuts, but seriously, they're worth every single penny! This is DEFINITELY one to add to your holiday cookie repertoire. Bring a batch or two to your next holiday cookie swap! Come to think of it, you should probably make a couple extra batches because they won't last long! Not even kidding. Cream sugars with butter. Then add eggs and vanilla. Beat at medium speed until light and fluffy. Mix flour, baking soda, salt together, then slowly add mixture to butter mixture. Add coconut and macadamia nuts until just combined. Bake for 23 minutes at 300º F. Remove to a flat surface to cool. There's really nothing I can add to this recipe because it's perfect just as it is. The one thing I will say, though, is to make sure you include the salt. I can't say enough about how much of a difference it makes to add salt to your baked items, especially ones that contain any kind of nuts. The salt is what makes it!! I use salted butter for everything, and I STILL add the salt listed in the recipe. It makes all the difference in the world! If you're just like me and you can't leave a recipe alone no matter how perfect it is, you can add a a few white chocolate chips to the cookie dough. I'm sure Mrs. Fields won't mind! Ok, this one's quick and easy peasy. I know kale is very trendy at the moment, but when you get right down to it, there are many reasons why everyone is going crazy for it. Well, for one thing, it's like super crazy good for you. It has a ton of vitamins C and K and beta-carotene and antioxidants and about a bazillion other nutrients that I can't even pronounce. And on top of all of that, it's delicious!!! It's hearty enough that it still keeps its integrity when you cook it (instead of just turning to mush), and it doesn't disappear in the pan the way fresh spinach does when you cook it. This recipe is from Taste of Home, and I knew it was a winner at first glance. Frankly, you can cook anything with bacon, onions, and garlic, and I'm in heaven. When I made it for my Friendsgiving dinner, it was a big hit! But no one needed to know how easy it was. And remember, your Mom always said to eat your greens, right? She was absolutely right! I think maybe Popeye would have eaten kale instead of spinach if he had cooked it with bacon and onions and garlic. Just sayin! In a large saucepan, bring 1 in. of water to a boil. Add kale; cook for 10 minutes or until tender. Meanwhile, in a large nonstick skillet coated with cooking spray, cook bacon over medium heat until crisp. Using a slotted spoon, remove to paper towels; drain, reserving 1 teaspoon drippings. In the drippings, saute onions and garlic until onion is tender. Drain the kale; stir into onion mixture. Add salt, pepper and bacon; heat through. If you're not a fan or pork, try turkey bacon instead!! For a little extra added flavor, try cooking it in chicken broth instead of just plain water! 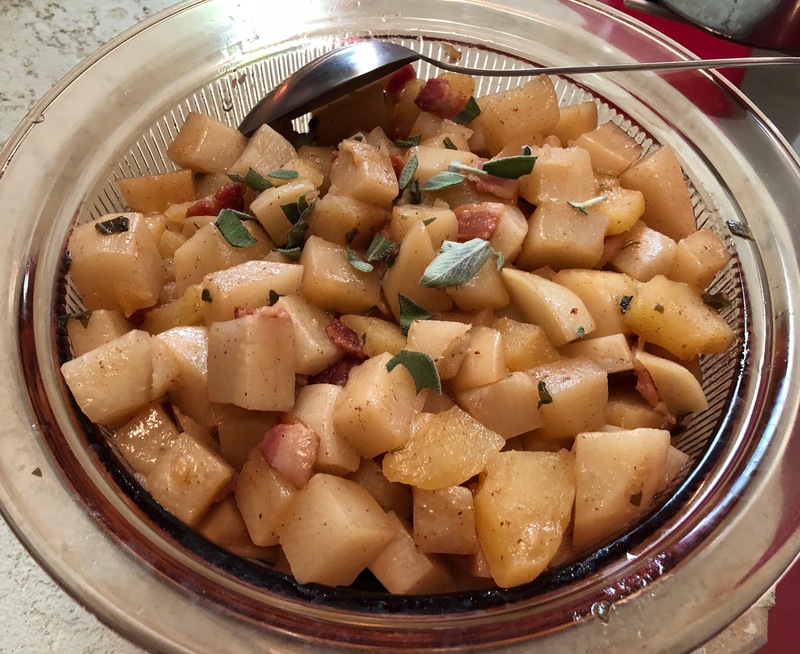 Here's another fabulous side dish that falls right in line with my latest obsession with apples and sage. It's from Finecooking.com, and I absolutely fell in love at first bite. It also fits my criteria for the perfect Thanksgiving dish because it's easy, you can do it ahead of time, and you can adjust the amounts to feed however big of a crowd you're having at your table this year. It's a pretty simple dish, but it really hits a lot of different notes that all work perfectly together. You have the sweetness from the apples and cider and the freshness from the sage, both of which mellow that sharp bite that the turnips can sometimes have. And we all know everything is better with bacon, right? That just goes without saying! It makes everything rich and special enough for your holiday guests. The other thing that I love about this recipe is that it is cooked on the stove top, not in the oven. If you've ever cooked Thanksgiving dinner, I'm sure I don't need to tell you that oven space is precious real estate that is not always readily available when you're trying to get everything cooked and hot at the same time. Having the option of cooking something without using the oven is a life saver (not to mention a time saver as well!) You just sit it on the back burner and let it braise until everything is nice and tender, and the cider is sweet and syrupy. YUM! Oh, and if you're not a fan of turnips, I think maybe you just haven't found the right recipe for them. This could be the one to change your mind! And if you've never tried them, well, now is the perfect opportunity! Enjoy! Peel the turnips and cut them in half lengthwise. Cut each half into wedges 1 inch thick at the widest point. Put the bacon pieces in a large skillet and set over medium heat. Cook, stirring occasionally, until crisp, about 8 minutes. Transfer to a plate lined with paper towels. Pour off the bacon fat from the pan and set the pan back on the burner. Add the butter and, when it’s melted, add the turnips, apple cider, sugar, and 1-1/2 tsp. salt. Bring to a boil over high heat. Cover the pan with the lid slightly askew, reduce the heat to medium high, and cook at a steady boil, shaking the pan occasionally, until the turnips are just tender but not soft (a pairing knife should enter a turnip with just a little resistance), 8 to 10 minutes. Meanwhile, peel and core the apple and cut it into 1/2-inch slices. Uncover the pan, add the sliced apples and sage, and continue to boil, stirring occasionally, until the liquid has reduced to a sticky glaze, 2 to 3 minutes. The turnips should be soft and the apples should be crisp-tender. (If not, add a few tablespoons of water and continue to cook for another 1 to 2 minutes.) Toss in the cooked bacon and season to taste with black pepper and more salt if necessary. I know I usually like to switch things around and tweak a recipe here and there, but for this one, I didn't change a thing! It's just absolutely delicious as it is. I used Honeycrisp apples, because they're my favorite. What's yours? I also didn't drain out all of the bacon fat as instructed, because... bacon. If there was ever a dish that screams home cooking, it's a casserole. By definition, a casserole is a dish served in the pan in which it was cooked, and it often has meat and vegetables and a crunchy or cheesy topping. That sounds like home cooking to me! For this casserole, there's no meat, but the veggies are a match made in culinary heaven! Who would have ever guessed that something as simple as cauliflower and carrots would go so well together in a casserole???? Well, Pillsbury, for one, which is where I first discovered the recipe. But here's the thing.. when I first made Pillsbury's recipe, I found the cheese sauce to be just SO bland. Like, there wasn't really anything special about it. It just tasted like melted American cheese. Now, I love American cheese as much as anyone, but for a casserole to be good enough for Thanksgiving, it needed to be just a little more fabulous, in my humble opinion. So I gave it a little makeover. OMG it was SO much better!!! Clearly, they should have asked my opinion as they were developing this recipe! LOL I'm not even kidding. Just the addition of a couple extra ingredients pushed everything WAY over the top and suddenly now we've gone from boring to showstopper! So if you're looking for a new something to add to your Thanksgiving menu, consider giving this one a try! Even if you're not making it for a big holiday meal, it's still easy enough for a simple Sunday supper. This just might become a new favorite! Heat oven to 350°F. Spray 2 1/2-quart casserole with cooking spray. In a large pot, bring about 8 cups of water to a boil. Add carrots and cook for about 10 minutes. Add the cauliflower and cook for an additional 4 minutes. Drain and set aside. Meanwhile, in 4-quart saucepan, melt 3 tablespoons of the butter. Cook onion in butter about 4 minutes, stirring occasionally, until softened. Add garlic and thyme. Saute a minute or two longer. Stir in flour, mustard, salt, and pepper with whisk; cook about 1 minute or until bubbly. Slowly stir in milk. Cook and stir until bubbly and slightly thickened. Remove from heat; stir in cheeses until melted. Stir in carrots and cauliflower. Pour into casserole. In small microwavable bowl, microwave remaining 3 tablespoons butter on high for 1 minute or until melted; stir in bread crumbs. Sprinkle over vegetable mixture. Bake uncovered 25 to 30 minutes or until bubbly around edges. Let stand 5 minutes before serving. For a little extra something, add a splash of white wine to your cheese sauce. It will elevate it to "special occasion" status! Use whatever veggies you like! You could absolutely add broccoli or parsnips or even just baby red potatoes. Anything you like! Not a fan of American cheese? Use any kind you like? Any cheese that melts really well will work! Can one really ever have too many potato recipes???? I think not! So here's an easy one that you can prep the night before your big holiday meal, and then just turn it on in the morning. SO easy!!! When you're cooking for a crowd and you have several pots and pans going at the same time on the stove, isn't it nice to know you have another alternative? Of course, I'm talking about your slow cooker!!! To be quite honest, I've been using mine quite a lot lately and it has become one of my most favorite items in the kitchen. It works miracles! Even the novice cook will have great success using a slow cooker, especially with a recipe as easy as this one. I got it from a video on Thekitchn.com and it's pretty amazing. They did mention one thing, though. 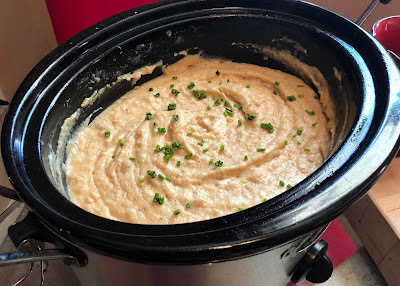 The longer your potatoes cook, the more they will brown around the edges of the crock pot. They advised scooping away the browned bits if you don't want them mixed into your mash, (I also wonder if giving it a stir every so often will prevent it from becoming brown), but frankly, I didn't see this as a problem. Did you ever watch Chef Anne Burrell? She's always saying "brown food tastes good!" And guess what! She's not wrong! I say let them get brown, mash 'em all together, stir in your butter and cream, and savor ever single bite! Now THAT's what I call Thanksgiving mashed potatoes! Boom. Lightly grease the slow cooker insert with butter or cooking spray. Peel the potatoes and chop into 1" small pieces. Transfer the potatoes to the slow cooker. Smash the garlic cloves, if using, and drop on top of the potatoes. Stir in the salt and a generous quantity of black pepper. Pour in 1 1/2 cups milk. Cover the slow cooker and cook 4 to 5 hours on HIGH or until the potatoes are very tender and soft. Turn the heat to WARM. When the potatoes are done, melt the butter in a saucepan over low heat. Stir 2 cups milk, or a mixture of milk and cream, into the melted butter and warm gently over low heat. If you used garlic but don't want the potatoes super garlicky, remove the garlic cloves and discard. Use a spoon to scoop out and discard any browned bits on the sides of the pot, if desired. Use a potato masher or ricer to mash the potatoes right in the pot. When the potatoes are as smooth as you like, slowly stir in the warmed dairy and butter. The potatoes will look soupy at first but the potatoes will quickly soak up the liquid. Add an additional 1/2 cup of milk or cream if you want them to be even creamier. Taste and season with additional salt or pepper, if desired. To keep the potatoes warm, leave in the covered slow cooker on the WARM setting for up to 4 hours. For dairy free potatoes, just use chicken or vegetable broth instead of butter and cream. For a little variety, add other root vegetables such as parsnips, turnips, rutabagas, and/or carrots. Ok, so let's talk about my FAVORITE new recipe in quite a long time. Every so often, I'll come up with an idea that I can't seem to get out of my head, and this was absolutely one of those times. I was thinking that I wanted to do a savory something with fresh pumpkin. A one-pot dish sounded like a good idea... maybe a soup? or a stew? Yes, definitely something along those lines. I also thought it might be cool to add a few other autumnal ingredients. Another kind of squash, maybe some corn, and definitely something green for color. I also had the idea to include barley to add a little body to the stew. Again, ideas that just stick in my mind until I go ahead and try them. I did some googling, found a couple recipes to use as inspiration, and this was the result! This stew has the most AMAZING flavor, you won't even believe it. I'm not even kidding when I tell you that I couldn't stop eating it! It's rich but not heavy, hearty but not too filling, fresh but still very deep with flavor. It's also cozy and comforting and it'll definitely hit the spot. It only took about an hour to make, but it has the taste of something that is simmered all afternoon. And it lends itself to any number of variations. I think that's one of my favorite things about this recipe. I'll probably NEVER make it the same way twice! Want to make it completely vegetarian? Use vegetable broth and leave out the meat. Don't like barley? Add rice instead! The possibilities are endless. I think the reason I love this one so much is that it feels like something my Mom would make. She used to say to me "Just put it in a pot and let it cook." It sounds simple, but seriously, that's how she always did it. It's definitely the best way to cook and it's how I learned! So you should absolutely give this one a try. It definitely tastes like home, like a big hug in a bowl. In a large pot, melt butter and oil together over medium heat. Add onions and garlic. Saute for just a few minutes until the onions begin to soften and the garlic becomes fragrant. Add the herbs, seasonings, pumpkin, and acorn squash. Toss all until well coated. Add the corn and the chicken broth. Bring it to a bowl then reduce the heat to simmer. Add the barley and give it a good stir. Simmer for about 45 minutes. Add the chopped kale and the shredded chicken. Stir in the cream. Make a slurry with the flour and 1/2 cup cold water. Add to the pot. Stir and simmer until it thickens. Adjust seasoning if needed. Remove thyme bundle and bay leaves from the pot. Serve deep soup bowls. Garnish each bowl with crumbled bacon, if desired. This is one of those recipes where you really don't need a recipe. The amounts are just guidelines. Taste as you go, and add as much or as little as you like. It will all work! I used pumpkin and sweet dumpling squash, but you can use butternut, acorn, or literally any of the nearly 150 varieties that are out there. Use any kind you like! Use potatoes instead of barley, add carrots, parsnips, turnips, or any other root vegetable. Use the recipe as a springboard to make it your own! This one is as surprisingly delicious as it is unexpected. I'm the first in line when it comes to pumpkin spice EVERYTHING, but I'm sure I've never thought of doing a pumpkin SALSA! And guess what!?!? It's absolutely DELISH!!! It has a few of your regular salsa ingredients but then it also has pumpkin and cinnamon too! Who knew?? Whodathunkit? Seriously, it really does work! I had a few friends over for a pumpkin themed dinner and movie, and they immediately LOVED it! They could instantly tell that it was PUMPKIN, but it still tastes like salsa! Crazy, right?? I think that tiny little bit of cinnamon is what makes it. It's really good!!! So if you're having a party, or just a simple movie night with a few friends, give the unexpected a try! The pumpkin fans in your life will thank you for it! Add a couple tbs of olive oil to a small sauce pan. Add minced onions and garlic. Gently saute until they begin to soften. Remove from heat. Add to a large mixing bowl, along with all remaining ingredients. Stir until well combined. Chill until ready to serve with your choice of chips. -If you are not a fan of cilantro, just use fresh parsley!!! -The next time I make this, I'll definitely add a can of whole kernel corn. I would have added it this time, but I didn't happen to have any on hand. You could also add a can of (drained and rinsed) black beans. If you're looking for a CLASSIC pumpkin cheesecake recipe, this is definitely it! As I was searching for recipes and comparing ingredients, I chose this one specifically because it doesn't have too many bells and whistles. Sometimes I find recipes that have so many fillings and toppings and spices that the main ingredient gets completely lost. But with this one, it's just straight up pumpkin and cream cheese, not too many spices, and a little cinnamon and whipped cream on top. In my humble opinion, it's how pumpkin cheesecake is supposed to taste! Ok, now, don't be intimidated by the thought of making a cheesecake. It's really easy! The most important thing is to buy a springform pan. After that, it's all downhill! Just follow the directions and there you go! This recipe is from Betty Crocker, but I tweaked it ever so slightly. It's so perfectly delicious. I think this is now my go to pumpkin cheesecake recipe. Once you taste it, it'll be yours too! Heat oven to 325°F. Grease 9-inch springform pan with shortening. In small bowl, mix cracker crumbs, 2 tablespoons granulated sugar, and the melted butter. Press crumb mixture in bottom of pan. Bake crust 8 to 10 minutes or until set. Cool 5 minutes at room temperature. Refrigerate about 5 minutes or until completely cooled. Meanwhile, in another small bowl, whisk flour, pumpkin pie spice, rum extract, and pumpkin together until well blended; set aside. In large bowl, beat cream cheese with electric mixer on medium speed until smooth and creamy. Gradually beat in brown sugar and granulated sugar until smooth. On low speed, beat in 1 egg at a time just until blended. Gradually stir in pumpkin mixture and heavy cream until smooth. Pour filling over crust. Bake 1 hour 15 minutes to 1 hour 25 minutes or until set but center of cheesecake still jiggles slightly when moved. Turn oven off; open oven door about 4 inches. Let cheesecake remain in oven 30 minutes. Run knife around edge of pan to loosen cheesecake. Cool in pan on wire rack 30 minutes. Refrigerate at least 6 hours or overnight before serving. To serve, run knife around edge of pan to loosen cheesecake. Carefully remove side of pan before cutting cheesecake. Top with whipped cream, if desired. Store covered in refrigerator. The original recipe called for adding 2 tbs brandy. I decided to add 1 tsp rum extract instead. It was a total game changer! In fact, I think it's what makes this pumpkin cheesecake stand out from all the rest! I also added the heavy cream to the batter (which was also not in the original recipe) because I think it makes it more velvety and smooth. Just sayin! If you're worried about your cheesecake cracking in the center, I've heard that it helps to put a pan of hot water in the oven on the rack below your cheesecake. TBH, I'm not sure if that works or not. As far as I can tell, the main factor in cheesecake crackage is temperature. If you take a hot cheesecake out of the oven and put it in the cold fridge, you're gonna wind up with the San Andreas Fault right down the middle of your cake. Best to leave it in the oven and turn off the heat, then let it SLOWLY cool to room temperature before you put it in the fridge to chill. And if you do wind up with the San Andreas Fault, don't worry! Just cover the top with whipped cream! No one will ever know! I was recently looking for a pumpkin cheese something, and I happened upon these little gems on Sally's Baking Addiction. Honestly, if you've never looked at her website, you really should. 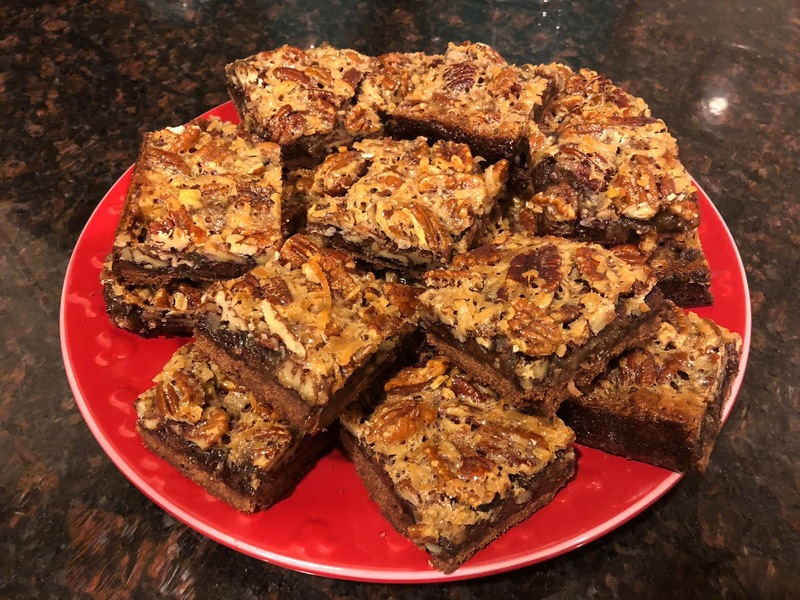 I've shared many of her recipes in the past, and they never disappoint! The same is true for this one! They're rich but not heavy, and have just the right amount of sweetness to let the pumpkin and spices shine through. And the gingersnap crust makes it even better! OK, ok, I know it may seem like there are a lot of ingredients and a lot of steps, but it's really not that big of a deal. You just make each component and you layer it on top, that's all. Easy peasy! And one of my favorite things about this recipe is the fact that you do it ahead. Since it needs to refrigerate for several hours, you can easily do this a day or two ahead of time which makes it a time saver! Take it from someone who is ALL about time management when it comes to cooking for a big crowd. If you can do anything ahead of time, do it! So, thank you, Sally, for sharing your awesome recipe. And if you love pumpkin as much as I do, you need to try this recipe. You'll be glad you did! Preheat the oven to 325°F. Line the bottom and sides of an 8-inch or 9-inch baking pan with aluminum foil or parchment paper, leaving enough overhang on all sides. Set aside. Mix the cookie crumbs, sugar, and butter together in a medium bowl until combined. Press into the bottom of the prepared pan. The crust will be thick. Bake the crust for 10 minutes as you prepare the filling. Turn oven up to 350°F. Using a handheld or stand mixer fitted with a paddle attachment, beat the cream cheese and sugar together in a large bowl on high speed until creamy and smooth, about 1 minute. On low speed, add the eggs one at a time, beating well after each addition. On medium speed, beat the vanilla, pumpkin, sour cream, cinnamon, cloves, nutmeg, and ginger in. Continue beating until everything is combined and creamy. Pour the filling into the warm crust. Set aside. Whisk the oats, brown sugar, cinnamon, and flour together in a medium bowl. Cut in the chilled butter with a pastry blender or two forks (or even with your hands) until the mixture resembles coarse crumbs. Sprinkle evenly over filling. Bake for about 45 minutes, making sure to loosely cover the bars with aluminum foil around the 30 minute mark. The foil prevents the top from getting too brown. The bars are done when the edges are lightly browned and the center is set-- this could be slightly before or after the 40 minute mark. Allow to cool in the pan set on a wire rack at room temperature for 1 hour. Transfer to the refrigerator to chill for 3 additional hours - or overnight. Lift the foil or parchment out of the pan using the overhang on the sides and cut into bars. I usually cut them into 16 smaller bars, but you can cut them into 12 larger bars. Just whisk the glaze ingredients together until smooth. Drizzle bars with glaze or top with whipped cream if desired. Instead of gingersnaps, use any kind of cookie you like! shortbread, vanilla wafers, and of course graham crackers would be great as well! Wanna make it in a 9x13 pan? double everything! Sally's make ahead tip is the bars stay fresh in an airtight container in the refrigerator for up to 5 days. You can freeze the bars for up to 3 months. Then, thaw overnight in the refrigerator before serving and glazing. 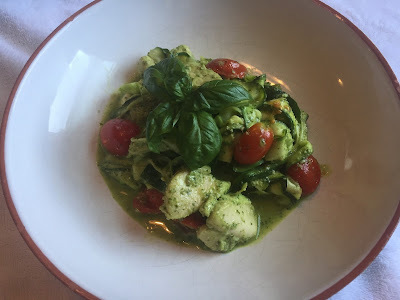 Whenever I start to blog about a recipe, I always try to find something creative to add to the story. It could be where/how I happened to find the recipe, or maybe it was for a specific event or something seasonally festive. But somehow my blogs all wind up sounding the same "this recipe is so easy!" or "it's the perfect recipe to make ahead of time!" or "it's so delicious!" and of course "You should try this!" But here's the thing.. Those are my FAVORITE kinds of recipes! I mean, that's pretty much the best kind of recipe, right? One that is easy, convenient, and delish!! So I'm making no apologies for sometimes sounding like a broken record. There. I said it. So this brings me to this week's recipe! It's SUPER easy to make, it's a total do ahead, and you won't even believe how delicious it is!! (you knew I was gonna say that, right?). I made this for Anthony, one of my dearest friends in the whole wide world, and he texted me the very next day saying "I NEED to try to make this cake! It's my new favorite thing!" hehehe That works for me! I also shared some with my friend Michelle and she immediately asked me for the recipe. So there you go. This one meets all of the CWJ criteria and I'm owning the fact that I often say the same thing about my recipes because it's all still true! Oh, and one more thing... You should definitely try this!!!!! Preheat oven to 350F. Lightly grease an 8x8 square pan. In a large bowl, mix together the flour, baking powder, baking soda, cinnamon, spice blend, and salt. In another large mixing bowl, beat together on medium speed the oil, sugar, and brown sugar until combined. Beat in the egg until smooth. Beat in the pumpkin and vanilla. Add the flour mixture alternately with the milk, adding the flour in 3 additions and the milk in 2 additions (begin and end with dry ingredients). Spread the batter into the pan and bake 25-30 minutes or until a toothpick inserted in the center comes out clean. Cool for 15 minutes. Meanwhile, combine the caramel sauce with the cream and pinch of salt. While the cake is still warm, poke roughly 16 holes into the cake (4 rows of 4 holes each) with the bottom of a long and round handle of a wooden spoon or similar object. Pour caramel mixture over the cake, making sure to fill the holes. Let the cake cool completely. Stir the powdered sugar and vanilla into the heavy cream until dissolved, then whip into stiff peaks. Top your chilled cake with whipped cream (be sure to fill up the holes!) and serve. If you want to use a 9x13 pan, just double everything! Then you'll be able to use up the whole can of pumpkin instead of using just a cup and then having nothing to do with the rest. The can of pumpkin may be just shy of the doubled amount, but I think it'll be close enough that you can get away with it. Don't forget to double the caramel mixture as well! If you like, you can add a little extra salt to the caramel and cream. Because, well, salted caramel. As always, whenever I'm baking something in a pan, I like to line it with parchment paper with a couple inches hanging over the edge. Then I can use the paper as a sling to lift the whole thing out of the pan at once. In this case, I left it in the pan, poured the caramel sauce over everything, then chilled it in the fridge before removing it from the pan. For years and years, any time I've ever made pumpkin bread, I've used my Mom's recipe for Pumpkin Loaf. 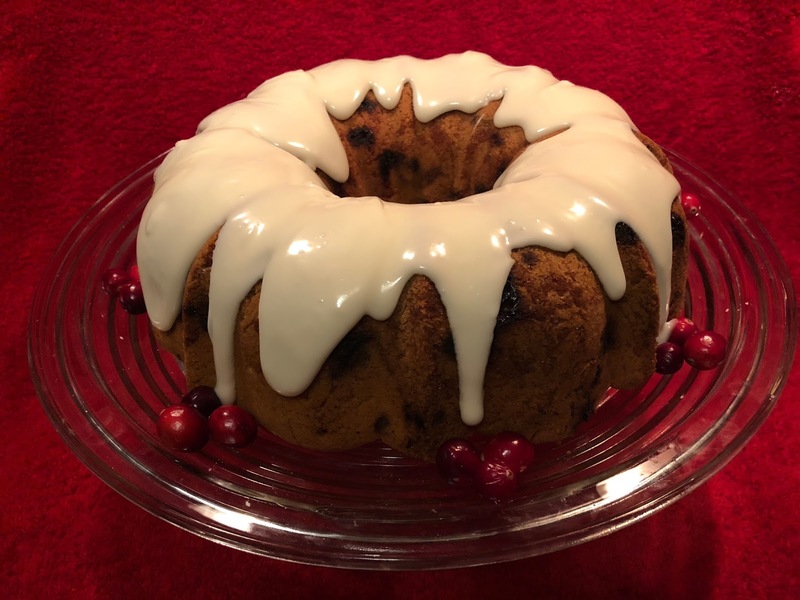 It's simply perfect as it is, doesn't need any bells or whistles (as my Mom would say), doesn't need any icing or even powdered sugar. It's perfect as it is. Oh wait, actually, there is one other thing I should say.. I love all of the tips that are included right in the recipe about testing for doneness. My favorite sentence is "Watch your bread, not the clock." I think that hits a note with me because that's how Mom always cooked. If you asked her how long to cook something, she'd say "Until it's done." Gotta love it! Thanx, Averie! Bread – In a large bowl, add the the first ten ingredients, through ground nutmeg, and whisk to combine. Add the flour, baking powder, baking soda, optional salt, and fold with spatula or stir gently with a spoon until just combined; don’t overmix; set aside. Turn about two-thirds of the batter out into the prepared pan, smoothing the top lightly with a spatula and pushing it into corners and sides as necessary; set aside. Cream Cheese Filling – In a large bowl, add all ingredients and whisk to combine. Alternatively, mix with a hand mixer. Evenly pour filling mixture over the bread, smoothing the top lightly with a spatula and pushing it into corners and sides as necessary. Top filling with remaining pumpkin batter, smoothing the top very lightly with a spatula as to not disturb cream cheese layer and pushing batter into corners and sides as necessary. Bake for about 48 minutes or until the top is domed, golden, and the center is set, and a toothpick inserted in the center comes out clean, or with a few moist crumbs, but no batter. Note this is tricky because the cream cheese never gets totally solid so the toothpick test isn’t the most accurate. Tip – Tent the pan with a sheet of foil draped over it at the 35 minute-mark if you feel the tops and sides will become too browned before center cooks through. Baking times will vary based on moisture content of pumpkin, cream cheese, climate, and oven variances. Bake until done; watch your bread, not the clock. Allow bread to cool in pan for about 15 minutes before turning out on a wire rack to cool completely before slicing and serving. I didn't have coconut oil, so I used regular vegetable oil. Worked perfectly! I added extra spice because I like a spicier pumpkin bread, and in my opinion there's no such thing as too much cinnamon! I also added the optional pinch of salt because it makes everything taste better!! On Averie's blog, it says "Bread will keep airtight at room temperature for up to 1 week, or in the freezer for up to 6 months." My only thought is that there's no way this will last a week sitting on the counter. Mine was gone after the first day!